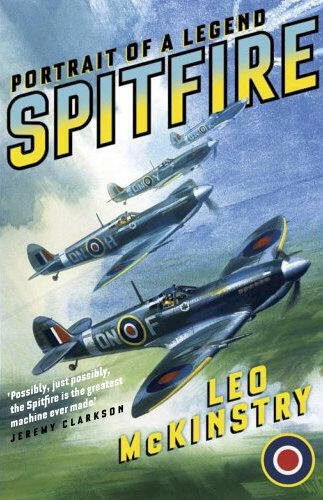 With the abundance of Spitfire books out there and one or two acknowledged “bibles” on the subject, would there be a room for a book which attempts to tell the whole Spitfire story in a single volume? The story which seemingly has been told many times over – by those who flew or built it, by war historians, engineers, and by a crowd of other authors just inspired by the beauty of the machine. I remember that when I first opened Leo McKinstry’s book Spitfire: Portrait of a Legend I was as sceptical as I was apprehensive. Today, a year later, I find myself repeatedly returning to this book – to look up this or that, find a memorable quote, re-read a chapter or two. A practical proof of my conviction: MicKinstry’s book is a work of significance. If you read books about Mitchell’s successful little fighter before, you’ll know the canvas of the Spitfire story. Schneider Trophy, elliptical wings, the Merlin engine, Dunkirk, Battle of Britain, photo-reconnaissance missions, defence of Malta, Africa and Italy, Darwin, D-Day, fighter-bombers, defence against the V1, victory. Any Spitfire story must be affixed to these pivotal subjects. And frankly, telling something that hasn’t previously been written by someone else is not an easy task. With 448 pages of text, Spitfire: Portrait of a Legend has an air of seriousness about it. Seemingly comprehensive, it is aimed at the reading audience leaving out those hunting for quick reference. There are no technical details, no drawings, no colour profiles, nothing to satisfy the superficial interests of the modelling crowd. Instead, this book is aiming at providing a broad insight into the history of the Spitfire’s creation and service, balancing the stories of those that built it, flew it with those that provided the often hidden but equally important servicing and repair. Leo McKinstry does not conceal the fact that he, like many, had been captivated by the irresistible glamour of the Spitfire. Despite this, his book represents a serious attempt to discuss the aircraft and its history in a fair, balanced manner, without the usual romanticisms. Thus the the Spitfire saga presented by the author is filled with setbacks. For example, Reginald Mitchell was shy and ‘hopelessly unpunctual’, the factory at Southampton too small, factory workers at CBAF demoralised and ill-managed, the shambles between Vickers and the MoD contributed to chronic shortage of fighters which, McKinstry argues, ‘heavily influenced Neville Chamberlain in his negotiations with Hitler’. The research that has gone into this work is extensive. As a result, the author offers a refreshing new perspective on some aspects of the Spitfire story. Personally, I found the in-depth analysis of getting the fighter into mass production and the political wrangling surrounding the process particularly enlightening. And yes, the first edition of the book was criticised for some minor errors – such as referring to V-1 as rocket-powered, but these were few and didn’t detract from the overall impression of thorough ground work. Also, I haven’t noticed such discrepancies in the second paperback edition, although it may be me. The book is not all facts. The author makes several diversions from the chronology of events, discussing various related subjects such as the origins of the Spitfire legend – qualities that made it a symbol on both sides of the conflict, or Noel Pemberton Billing and the spirit of the Supermarine company. If there is any problem with the narrative, it is that the later part of the Spitfire story – from 1943 onwards – is not treated nearly to the same level of attention and detail as the years 1935-1940. Indeed, the story of the aircraft’s development and service up to the end of the Battle of Britain takes about 2/3 of the book. The remaining four war years, although characterized by the vast international deployment of this aircraft across many continents, are in comparison treated rather shortly on the remaining 150 or so pages, which, in my opinion, slightly spoils the balance of McKinstry’s story. That said, this work is a compelling read, gracefully balancing sophisticated facts with readability, with tightly written language which makes one always want to continue to another chapter. McKinstry’s long experience as a professional journalist (and political commentator) is put to good use and makes reading this book a very enjoyable experience. A joy to read for anyone interested in the Spitfire and, for once, a book which will also add to the knowledge of those who are already well familiar with this classic aircraft. It will also hold on its own for anyone looking for a good piece of non-fiction.